Large amounts of data can be transmitted outstadingly with fiber-optic systems. 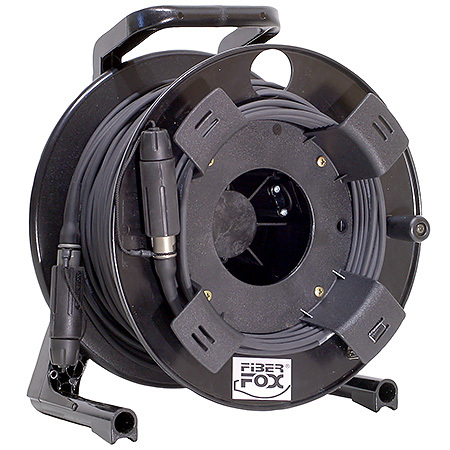 Any weaknesses in relation to cables or connectors will be completely eliminated by using the FIBERFOX system. Durability, reliability and easy handling are priorities because the material must withstand the highest demands that are placed on it by stresses and strains during mobile use. Data rates have risen enormously, especial­ly with the introduction of HD television. 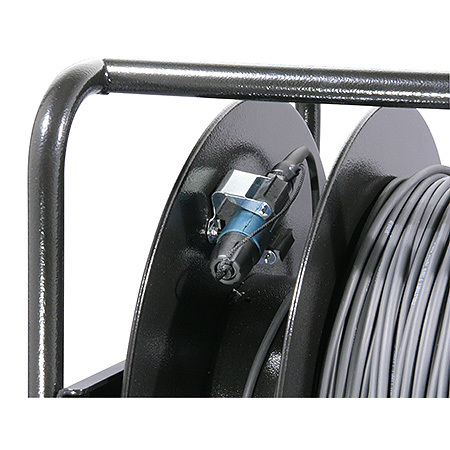 This means that video technology also needs efficient and reliable transmission cables on an optical basis for shorter di­stances nowadays, wherever copper coax cables or fibre optic cables were used for long lines formerly. There are great reservations against this technology in some parts of the TV indu­stry, although fibre optic cables have been used in the environment of telecoms or with the armed forces for years. One reason for this situation probably results from the ex­perience that was gained with fibre optics in the past. Constant movement caused by rigging and de-rigging when using an OB van for transmitting sports events or other events proves the extreme demands which are made on the material. The functionality must be ensured always, even in harsh en­vironmental conditions like rain, cold, heat, dust or mud. So-called ‘physical contact’ fibre optic ter­minations are usually used in the TV indu­stry too. 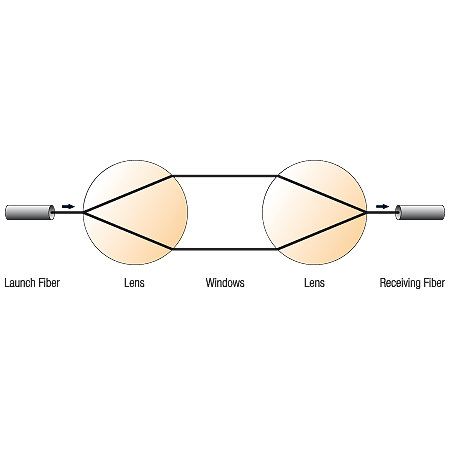 They require connectors with which the ends of glass fibres can be led di- rectly to one another without protection and with the highest degree of precision. The majority of hybrid connectors that are compatible with SMPTE must be included for this purpose, besides all of the usual connectors for computers. The main advan­tage of this technology is that the attenua­ting values are low at about 0.1 dB. Howe­ver, the disadvantages lie in increased ab­raision, the very low mating cycles (bet­ween 500 and 1,000 approximately) which result from that and the pronounced sensi­tivity to dirt. A single grain of dust can es­pecially cause malfunctions with singlemo­de technology which utilizes one core of glass fibres measuring only 0.009 mm be­cause it is relatively large when measured on the diameter of the glass fibres. What is more, every plugging operation causes ab­raision on the surfaces by means of tou­ching the unprotected ends of the glass fi­bres which worsens the attenuating values after a relatively short time. There is not any continuous worsening of the signal with glass fibre systems – nor with digital systems either – contrary to the analog environment. The system functions faultlessly first of all until the attenuating threshold is exceeded (typically because of a dirty connector or plug), then suffers total failure. There are indeed cleaning systems on the market but the damage to the surfa­ce remains when cleaning and plugging are carried out. It is this microscopically small surface which makes all direct connectors sensitive, unless they are used on the stu­dio floor or on the camera. 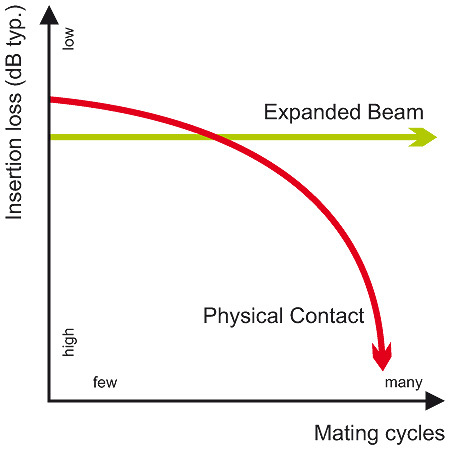 Lens connectors follow another approach: expanding the beam of light (expanded be­am) and plugging without touching the ends of the glass fibres (‘no physical contact’). So they avoid the most common failure of fibre optic connections. 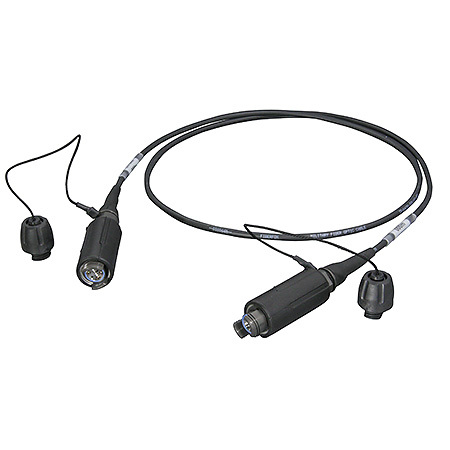 The beam of light at the output connector is expanded by more than 1000 times the area through a lens and it is re-combined in the input connector. Any soiling is not so decisive any more, on account of the enor­mous magnification of the beam’s surface. The ends of the glass fibres do not touch, abraision is avoided and thousands of plugging operations (typically 5000) do not inevitably lead to a worsening of the at­tenuating values. 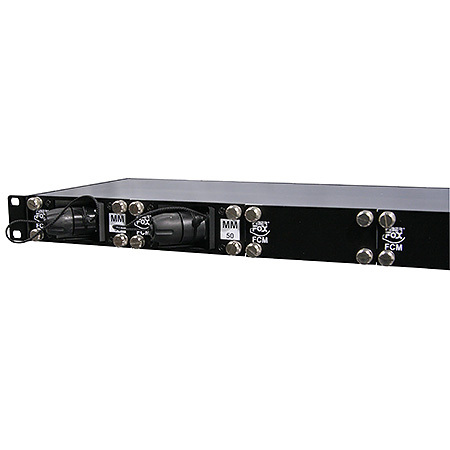 There is a technical price to pay for the system because the insertion loss per connector is typically about 1 dB (0.7 for singlemode). A physical contact connector that is subjected to similar stres- ses and strains would noticeably increase this value however and it would certainly fail completely in service. The lenses can be cleaned without any problems at all becau­se they have been hardened and react to touching insensitively. Even water (the enemy of every optical or electrical system) cannot penetrate into the glass fibres and make them ’blind’ – it suffices to simply wipe them off before connecting!